The folks at Time Out New York have offered some off-the-cuff blogging on Jane Jacobs and Forest City Ratner's Atlantic Yards, so I'll offer some off-the-cuff responses. Since the goal is to make this interesting, I’m starting it controversially: I think J.J. would approve of Atlantic Yards. Actually, she was a cranky broad who no doubt would have found many faults with it. Let me rephrase. I think Atlantic Yards largely follows Jacobs’s principles and would enliven that neighborhood in a way she would admire. What neighborhood? Atlantic Yards would be in a border zone, at the edge of Prospect Heights, across a highway from Fort Greene, nudging up against Park Slope and Boerum Hill, and extending the reach of Downtown Brooklyn. As for following Jacobsian principles, well, I disagree. Let’s look at it through the J.J. lens. That neighborhood right now is an ugly traffic confluence and not much else. It’s full of chain stores and terrible for pedestrian traffic. Atlantic Yards would add an amenity where there is none. Though I’m not intimately familiar with the plans, I know it includes extensive mixed-use and varied street-level commercial space, along with many residential units (and a hotel, I believe). It would increase the density of that area, as Jacobs prefers. The "neighborhood" is not an ugly traffic confluence; the western border of the site footprint is that. I know that Jacobs was not a fan of megaproject-style development because she favored a variety of new and old buildings, but what else can a stadium be but a megaproject? It strikes me as the type of primary-use anchor (like the nautical museum she proposed for lower Manhattan) that she recommends for dull neighborhoods that need a boost. Furthermore, in the time since Death and Life was written, adding stadia to urban settings has been a proven method for bringing a shabby area back to life. (Baltimore was the first major example of this.) There are also ways to mitigate the project’s less Jacobsian qualities—for example, increasing the affordable-housing ratio and adding pedestrian streets to break up the scale somewhat. 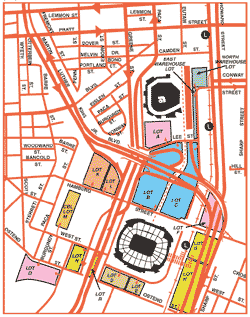 Baltimore's Camden Yards is very different from the planned Atlantic Yards, with its baseball and football stadiums separated from residential neighborhoods by a couple of cordons and several parking lots. As for a sports facility as inevitable megaproject, yes, but that doesn't mean 16 towers should be built by one architect and one developer. Yes, streets could be added, but that's the UNITY plan, not Atlantic Yards. I don’t think it’s the “unique quality” of Brooklyn that opponents want to protect; it’s their low rents (which is totally legit—they should just admit to that). And they cast themselves as Jacobs-like crusaders because they don’t know any better. Jane would be ashamed. Some AY opponents want to protect their low rents or the quality of life they lucked into by moving to Brooklyn at a certain time--and enduring some bad times--for a certain price. And others just might worry about issues like process and good government. The residential area of Atlantic Yards should be pretty jam-packed with people, but I’m not sure it will have the number of small businesses needed (I could be wrong, I haven’t done the homework here) to perpetuate the kind of sidewalk vigilance that Jacobs finds necessary for safe and prosperous urban dwelling. There might indeed by sidewalk vigilance, but not in areas without streets. My two cents on J.J. and the Yards (what a great band name) is that she would be torn: On the one hand, big parts of the designated area ain’t great shakes right now, as Dustin pointed out. I was biking there with my wife on Sunday and there are long stretches of pretty desolate streets. On the other hand, the Yards project is bound to be a big bag of corporate candy. Picture our “Has Manhattan lost its soul?” cover times 50. (To say nothing of game-night traffic—how bout some congestion pricing there, Bloomie?) And I’m not convinced by the “stadiums revive urban areas” argument. The big bag of corporate candy starts with the naming rights to Barclays Center and would extend to new advertising signage. As for whether there are desolate streets, that's a false dichotomy. People and business have been bought out, buildings have been demolished, and the area has stagnated. Despite what the Empire State Development Corporation said, Atlantic Yards would be one solution to the current desolation, but not the only one. What a Dustin’ up poor Jane Jacobs takes from Mr. Dustin Goot writing for Time Out Magazine! In my mind I hear the phrase: “Oh come now!” and I am tempted to crack ad hominem and say that Ratner’s check to him is in the mail, but I would suggest that the public would be better served if Dustin would confine himself to covering fluffy subjects like on-line dating that don’t benefit from deep thought or credentials and where flippant glibosity may actually serve the topic. (Warning: trying to follow the Google trail from DG’s name I ran into what appeared to be some incipient virus problems.) Going from Dustin to Justin, Justin Davidson has some words of warning in “See Jane Be Co-opted” in the 10/01/2007 New York Magazine that apply to Goot to boot (What a hoot! ): “NATURALLY, THOSE WHO LACK HER PERCEPTIVENESS HAVE ENTHUSIASTICALLY PERVERTED HER MAJOR POINTS (emphasis supplied). As with many prophets (Muhammad, Marx, Lennon), JACOBS’S NAME HAS BEEN ATTACHED TO PROJECTS AND CAUSES THAT WOULD LIKELY MAKE HER CRINGE (emphasis supplied). She pointed out that a neighborhood feels most like a neighborhood when it has a mix of uses that keep it busy all day and into the night. SO DEVELOPERS OF THOSE MEGALITHIC COMPLEXES COMBINING THEATERS, HOTELS, APARTMENTS, OFFICES, AND MALLS CLAIM THAT JACOBS WOULD’VE LIKED THEM (emphasis supplied) because they are thronged around the clock. Yes, there is a race to co-opt Jane Jacobs going on right now and it is our job to respond by observing our city and neighborhoods carefully, acknowledge what we see and take appropriate action.